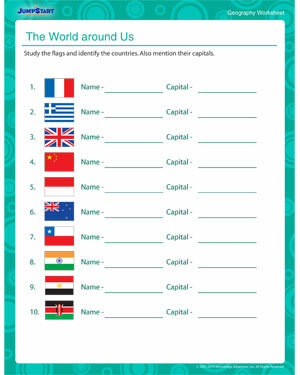 ‘The World Around Us’ is a free printable social studies worksheet that introduces curious fifth graders to different countries, their capitals and flags. In this simple geography worksheet for 5th grade, kids have to look at the maps on the left, identify the countries and write down their names and their capitals in the spaces provided. This is a great exercise to help the youngsters get to know the world around them better. Check out our other fun geography worksheets now!